The Journal reflects the current trends of development in fundamental and applied mining sciences. It publishes original articles on geomechanics and geoinformation science, investigation of relationships between global geodynamic processes and man-induced disasters, physical and mathematical modeling of rheological and wave processes in multiphase structural geological media, rock failure, analysis and synthesis of mechanisms, automatic machines, and robots, science of mining machines, creation of resource-saving and ecologically safe technologies of mineral mining, mine aerology and mine thermal physics, coal seam degassing, mechanisms for origination of spontaneous fires and methods for their extinction, mineral dressing, and bowel exploitation. 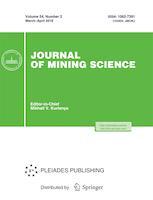 Journal of Mining Science is a peer reviewed journal. We use a single blind peer review format. Our team of reviewers includes over 100 reviewers, both internal and external (75%), from 15 countries. The average period from submission to first decision in 2017 was 15 days, and that from first decision to acceptance was 90 days. The rejection rate for submitted manuscripts in 2017 was 50%. The final decision on the acceptance of an article for publication is made by the Editorial Board.